The Curiosity rover has landed on Mars, driven around, started its scientific mission and, as of 4am today (AEDT), started reporting integrated science results. In a news conference at the American Geophysical Union NASA’s Curiosity mission team presented a measured, low-key and hype-free discussion about the first use of Curiosity’s full array of analytical instruments. What they have found are chlorinated hydrocarbons – simple organic molecules made up of carbon, chlorine and hydrogen, sulphur-containing compounds, and calcium perchlorate. Perchlorates are salts that, when dissolved in water, lower the freezing temperature of that water. 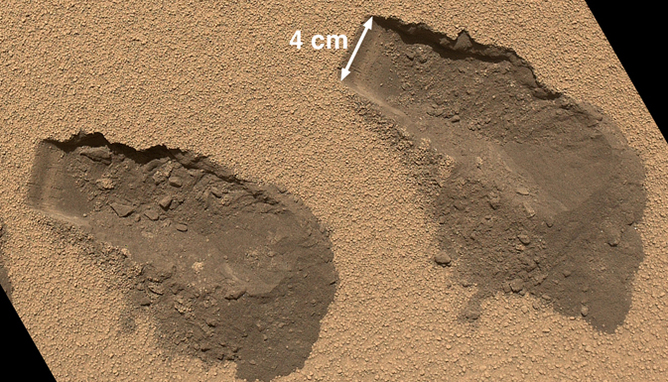 The presence of those salts could enable water to stay liquid in the near-surface layers of martian soil. This could provide a possible habitat for Martian microbes. The discovery of perchlorates supports the 2008 finding made by NASA’s Phoenix lander, which detected perchlorate salts in soil samples from Mars’s north polar region. Being a stationary craft, Phoenix could only take limited samples and used a simpler “wet-chemistry” analytical instrument. 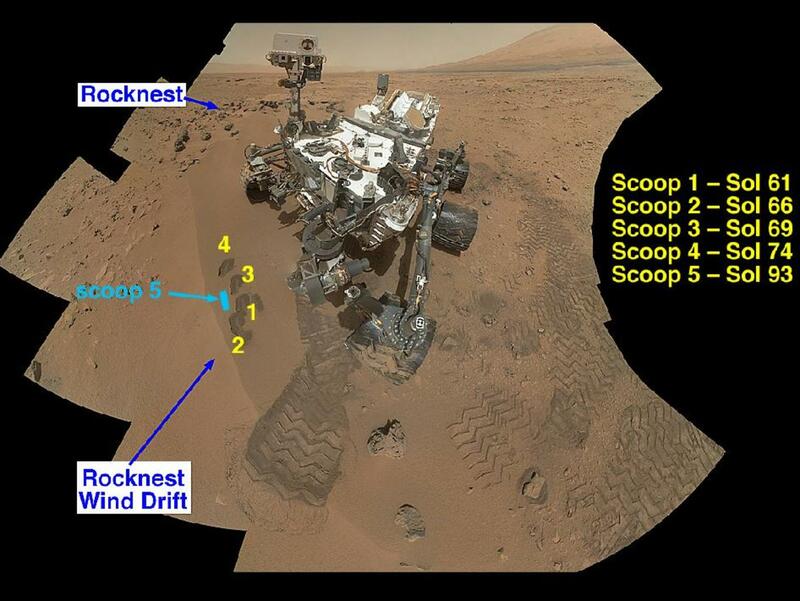 NASA’s Curiosity rover documented itself in the context of its work site, an area called “Rocknest Wind Drift,” on the 84th Martian day, or sol, of its mission (Oct. 31, 2012). The rover worked at this location from Sol 56 (Oct. 2, 2012) to Sol 100 (Nov. 16, 2012). The announcement of results from Curiosity comes after weeks of excited anticipation from scientists and the general public alike, following suggestions NASA was getting ready to announce the discovery of life on Mars. The data is one for the history books. It’s looking really good. This exuberant exclamation about the analysis of Martian soil samples, set off a frenzy of speculation on the internet and since then NASA has been working hard to lower expectations. In the lead-up to this morning’s press conference NASA even revealed that no, they weren’t about to announce the discovery of life. It’s important to keep in mind that Curiosity never set out to find life. In fact it’s been suggested that, barring an alien waving at Curiosity’s many cameras, life would be more or less undetectable by the rover. What Curiosity is trying to do is assess the habitability of Mars, both in the past and in the present. Has Mars got the required minerals and energy sources for primitive life to exist? Was there ever a water source that could have aided transport and delivery of these nutrients? Scoop marks in the sand at ‘Rocknest’ This is a view of the third (left) and fourth (right) trenches made by the 4cm-wide scoop on NASA’s Mars rover Curiosity in October 2012. To this end, Curiosity is checking the Martian soil for organic molecules – carbon-containing chemicals and salts that could be ingredients for life. Just like the ones it has found. The newly announced results follow Curiosity’s investigation of sandy soil at a site called “Rocknest”. This site was chosen to provide the first samples of “normal” soil (as if interplanetary soil could ever be normal). Using a mechanism on its robotic arm, Curiosity dug up five scoopfuls of Martian soil, each from a pit roughly 4cm wide (see image above). 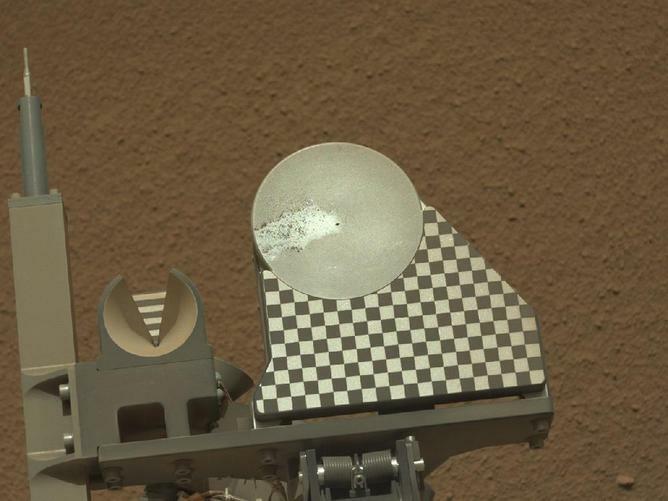 The first Rocknest scoop was collected on the mission’s 61st Martian day (also known as Sol 61) on October 7. Fine sand and dust from that first scoopful and two subsequent scoops were used to scrub the inside of Curiosity’s sample-handling mechanism and to ensure they were analysing the right soil. Samples from scoops three, four and five were then analysed by the chemistry and mineralogy instruments inside the rover. These findings are exciting for scientists – they are repeatable and clear enough for the science history books. After all, they are the first well-characterised Martian soil samples. Scientists now have integrated chemical, mineralogical and visual data, which the couldn’t get from earlier landers and rovers. The robotic arm on NASA’s Mars rover Curiosity delivered a sample of Martian soil to the rover’s observation tray for the first time during the mission’s 70th Martian day, or sol (Oct. 16, 2012). That said, it might take something a little bit “sexier” than soil analysis before the mainstream media reports Curiosity’s findings with as much gusto as it did with the rover’s landing. Many voiced frustration over the wait before today’s Curiosity announcement, but given past experience you can understand why NASA needed to scrutinise the results. We only need to cast our mind back to the “worms” of ALH84001 – supposed evidence for past life on Mars – and the report of arsenic-based life, both of which were eventually retracted by scientists. Imagine you had worked for ten years on this rover, no doubt putting in very long work days (and nights) and making the necessary life sacrifices. You’ve seen the ups and downs of the project and lived through the success of the terrifying landing earlier this year. Now it’s really happening and the data you have anticipated for years is finally pouring in, with a level of detail you could only have dreamt about. Who wouldn’t be keen to share the results with the world? It’s been a productive and trouble-free first three months for Curiosity and the mission team has completed most of its baseline data, instrument and rover testing. A drilling test experiment is yet to be completed before Curiosity moves on. Curiosity can sample rocks and soil by both scooping and drilling. Now that NASA is sure the analytical instruments are working, they can check out the drill attachment. Following the drilling test, Curiosity will rove slowly over to the 5.5km-high Mount Sharp via a site called Yellowknife Bay. Mount Sharp is the main investigative target of Curiosity’s primary mission and the point at which the science program gets into full gear. Mount Sharp’s slopes are gentle enough for Curiosity to climb, analysing and sampling as it goes. As it climbs it will be sampling younger and younger strata of rocks – it really is a Martian areological timeline. So as we wait for Curiosity to take the next steps (figuratively) on its mission to better understand the red planet, it’s worth remembering that we don’t need to find life for the mission to be both exciting and scientifically worthwhile.